This image was a revelation to me! Taken in low light, the original image held little interest when viewed simply as a photograph. The scene was grainy, the faces fuzzy, the background indistinct. Yet there is no other way to capture a scene like this one with a pocket camera. Flash is intrusive and would wash out the details and depth of the scene. Interestingly, with just a bit of digital darkroom processing, this scene took on the look of a painting and, suddenly, the qualities that might be seen as flaws in a photograph actually enhanced the pixographic image. The blurred background is wonderfully atmospheric. The light that was captured in the image shimmers on the surfaces and dances like candlelight giving the scene a wonderful glow. And since intrusive photographic techniques were not used, the scene remains natural and unforced. 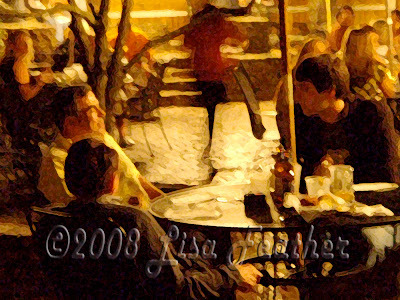 In this way a dinner companion was able to capture the casual mood of conversation and conviviality at his own table.